PORTLAND, Ore. (CNS) — Even in the solitude of her room at a retirement center, Anita Jazowick prays in sign language. She said she tells God her hopes and that she looks forward to seeing him. Jazowick is part of the Catholic Deaf Community of the Archdiocese of Portland, formed 60 years ago and recently energized with Masses in sign language each Sunday, a website, social media and a youth group. In addition to traveling to various churches in western Oregon, the ministry has found a home at St. Peter Parish in Portland. There, a chapel was outfitted with a semicircle of chairs and bright lights, both optimal for people worshipping in sign language. Jazowick became deaf as a child in Canada. At Mass with hearing people, everyone just waved and smiled. No one seemed to want to know her. That changed when she found St. Peter Chapel. 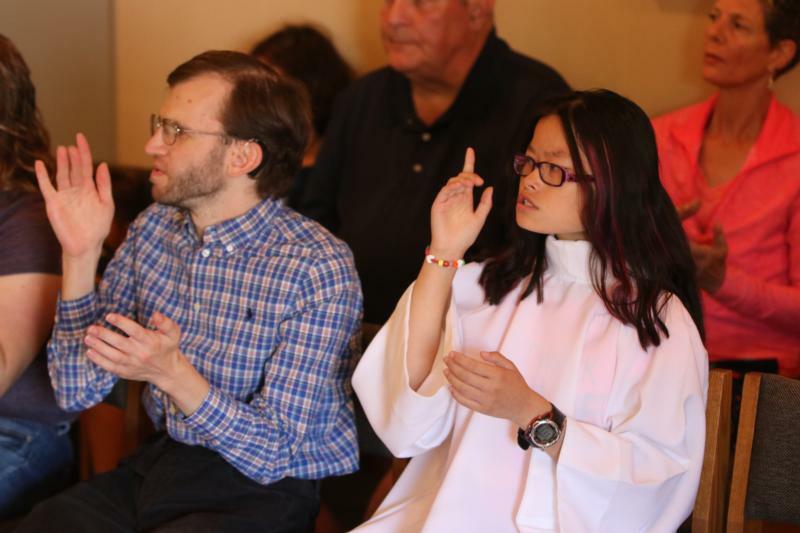 Worshipping with other deaf Catholics feels like home for Jazowick. She signs prayers and responses with others and communicates after Mass with peers who understand. Tim Blade, involved in western Oregon’s Catholic Deaf Community since 1977, has become a patriarch of sorts. He has the privilege of signing the Gospel reading and the congregation looks to him for wisdom. Blade, a former construction business owner, explains that people who are deaf learn to depend on God earlier than most. At Sunday Mass in early September, the Gospel reading told the story of how Jesus healed a man who was deaf. Father Raul Marquez, pastor of St. Peter Parish, asked the worshippers to explain what the Gospel meant to them. Blade walked to the ambo. All watched intently. Jilene Modlin, who worked for a decade at the Washington State School for the Deaf, coordinates ministry among deaf Catholics for the Archdiocese of Portland. The ministry now has a website and engages on social media. Modlin communicates frequently by text with Catholics who are deaf. “It brings people to us,” she told the Catholic Sentinel, Portland’s archdiocesan newspaper. One man rode a bus from Seattle, 150 miles away; another worshipper comes regularly from Myrtle Creek, not far from the Oregon-California border. Modlin estimates there are about 300 deaf practicing Catholics throughout western Oregon. About 30 attend the sign language Masses at St. Peter’s Chapel. In addition to Masses, there also are Bible studies and a youth group. In partnership with Oregon Catholic Press, the community has downloaded Scripture that is translated into the right order for sign language, a help for lectors or for deaf people who simply want to read the word of God. Modlin dreams of additional services, like a mobile phone app that will transcribe Catholic radio broadcasts into visual podcasts. She’d also like close captioned catechetical videos and webinar presentations. Christian service already is part of the community’s life. One day after Mass, worshippers made lunches for local homeless. Deaf Catholics explain that interpreters are no replacement for the Mass in sign language. Susan Teague of Beaverton said being deaf is more than a condition; it’s a culture. For deaf Catholics, being in a friendly environment is a way to keep the culture alive. The community also is trying to grow by reaching out, especially to youth and young adults. For too long, the church and society left deaf Catholics on the side, which made the church poorer, he added. In his homily at that Sunday Mass in September, Father Marquez said he would take the wisdom from the deaf parishioners to the rest of the parish. Editor’s Note: A Catholic Sentinel video on the Catholic Deaf Community can be viewed here. The community’s website is www.catholicdeaforegon.org.